Kitchen black and white flooring isn’t the only kitchen flooring design you can consider. If you want the checkerboard flooring kitchen look, consider colors besides black and white. 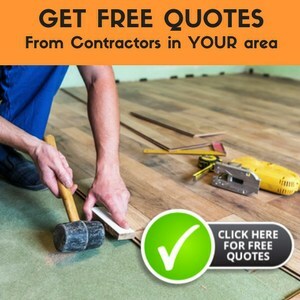 There are many approaches to designing kitchen floors, and one place to get good ideas for your kitchen flooring design is at either flooring stores or home improvement stores. Whatever you do, be sure to select a kitchen floor design you’ll enjoy for years. Kitchen flooring design has never been so much fun. With all of the choices in flooring, designing kitchen floors has moved away from the drab and boring into the fabulous and bright. If you can imagine and dream it, then you can achieve it with your kitchen floors. The color and material choices abound. The only hard part will be deciding on what material or colors to use in your kitchen area. Related: Check out our best selection of kitchen flooring options! Complete with reviews and comparisons. If you want to add color to your kitchen floors, then do it. With all of the different color choices available in tile, it is simple to add a splash of color to your kitchen floors. With just a colored tile here and there, you can create interest and fun to your kitchen. What an easy way to make your kitchen welcoming and inviting. You could install your tile in a checkerboard flooring kitchen design, too. If you like the clean look of black and white, you can even go with kitchen black and white flooring in a checkerboard or other design. Use your imagination and creativity to make a kitchen floor that you love. Pattern is fun to add to your kitchen floor as well. There are many different patterned tiles that are available. Scattering them about your kitchen floor design will give your floor that little bit of OOMPH that it needs to make it more inviting. Do not be afraid to choose patterned kitchen tiles. If you like it and it makes you feel good, then it is the right choice for you. Pattern gives a kitchen movement and interest, which makes the kitchen feel more fun and inviting than just one color of tile will. Use your creative side to make your kitchen into what you desire. Looking at kitchen flooring photos can help you design the floors in your kitchen as well. Taking their ideas and merging them with your own creativity will help you to create that custom look without that custom price. It is always a good idea to look at pictures of finished kitchen floor designs because it will help you to determine what kind of flooring you are drawn to for your own kitchen. Another thing you might want to consider doing is going to your home improvement or flooring store to look at design kitchens. These idea kitchens will help you to get a feel for what kitchen design that you like and desire for your own home. You will also get ideas for you to incorporate into your own kitchen. Kitchen flooring design does not have to be scary. Your kitchen should be your haven and should make your entire family feel welcome. Choose kitchen flooring that you like and that shows people coming into your home the entire family’s personality. Show your family’s fun and exciting side with flooring that has splashes of whimsy or show off your family’s adventurous side with flooring that is unique. Whichever way you choose to go, you will have kitchen flooring that reflects you and your family. Stone floors are natural, beautiful and always stylish FOR KITCHEN FLOORING DESIGNS.. It brings the color and texture of nature to homes and adds quality and warmth that’s not possible with any other material. The naturally cool, hard surface is ideal for warm climates and does not cling to dust. These types of KITCHEN FLOORING DESIGNS are almost indestructible. Here are some characteristics of the popular varieties one need to keep in mind before selecting. It is elegant and sophisticated in appearance. It is available in wide variety of colors and styles, and each has a unique pattern. It is one of the hardest and most durable among other natural stone floor tiles. Granite floors are usually polished and because of its polished finish it is very slippery. It is so thick that it does not conduct heat. It is eco-friendly and will not cause pollution. It has slightly translucent quality which allows illumination in kitchen. It is one of the most expensive kitchens flooring material. It has very low surface-resistance. It is relatively easy to stain and scratch. The cost of limestone flooring is cheaper than other natural stone. It gives a very rustic and old world look. It is one of the softer products which could easily chip or break. Before selecting do remember the pros and cons, KITCHEN FLOORING DESIGNS is essential to think and should be judged properly, after all, the kitchen is the busiest room in the house. I have a tiny kitchen. Black fridge, black convection/microwave countertop; black with stainless steel cooktop, stainless steel sink. I can’t figure out what type of countertop to get. Not much space left on it anyway and what dcolor to paint metal cabinets and floor. If you send me your email, I can send pictures. Oh yes, I have stainless steel square backsplash. Thanks. I would try to use colors that will compliment each other. What kind of a color scheme are you going for? What color are your walls? Do you have a wallpaper border or anything to try to compliment colors by pulling out some colors from a border? If you join up with a free photo hosting site, you’ll be able to copy/paste clickable links for your photos. I don’t know of anyone specifically selling remakes but an internet search might garner you a few possibilities. Please feel free to share anything you find with us here. Thanks!